I sat and watched The Vow with my wife (of course, the sweetheart fell asleep 1/2 way through) and all I could do was sit and cry. I thought about the moments I spent with her these last 13 years, 7 months, and 24 days. Some up, some down, some that have changed our lives forever. But moments that will forever bind us together, define who we are not only as a couple, but individually. I am not perfect. I have made my fair share of mistakes. But there is nothing in this world that I would not do to have my wife beside me. To hold her close and feel the warmth that radiates from her. And these last 4986 days have been, by far, the best of my life. And I would not change that for the world. I have not handled this journey well, at times. Not at all. There are things I am still trying to figure out. Things that I wish would come easy, things I wish I could change. But these moments, even the ones I mess up on, can only (eventually) make things stronger. But what I have to focus on are the things that I can change daily, moment by moment, that can make me a better man. A better father. A better husband. Most days I wake up and go to work, and I completely miss the point. The point of this incredible life God has blessed me with. All to often, we go about life and take for granted the lives we touch on a daily basis - heck, even our own life right in front of us! And I for one, am saddened by my misfortune. Another line that Leo says in the movie is actually his vows - "I vow to love you now and forever. I promise to never forget that this is once in a lifetime love. I vow to love you and no matter what challenges may carry us apart, we will always find a way back to each other." I don't want to give up, give in, take the easy road. Why would I want to do that? Did Jesus take the easy way out? Did John the Baptist or any of the other disciples for that matter take the easy way out? So, honestly, what gives me the right to take the easy road? Challenges come. But fighting is harder. Staying the course is harder. Taking the road less traveled is harder. I want to live my life in such a wife that my wife will fall in love with me all over again. That is my goal for the next 5,000 days - to make the next 5,000 days even better than the last 5,000 days. Because if I can do that, if I can live my life in such a way that the love of my life will fall MORE in love with me, than I have fulfilled my purpose in life. And isn't that what we are all striving to do? The next 5,000 days are going to be the best days I have ever known, for as Robert Frost once said, "two roads diverged in a wood, and I - I took the one less traveled by and that has made all the difference." Natalie's diagnosis is just a moment in a sea of moments, and I will not let that define us. Our moments range from our first childhood memory, to learning about and believing in Christ, to knowing each other, to falling in love with each other. What does the rest of our history hold? Dying? What about the pieces in between love and death? A tombstone has your birth year, a dash, and the year you die. What matters is the dash. And the sum of all of our moments make up that dash. The sum of all of the moments of our lives...that is what counts. Looking back on May, I think I can honestly say it was a fantastic month for our family. We were able to spend time together and make some fun memories. 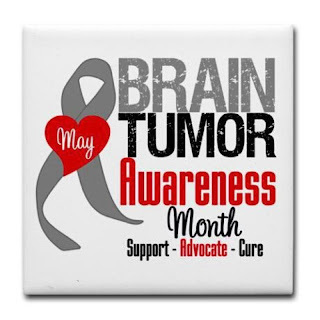 Since May is Brain Tumor Awareness Month I thought I would start with an update about my brain and the tumors attacking it! I watched "We Bought a Zoo" with the kids. It was very therapeutic for all 3 of us and Kirstyn is really thinking about why she has been so mean to me lately. She seems jealous of David's time w me and his long hours at work, she just struggles to articulate the pain and fear in kindness and she's not alone in that! Please continue to pray for my babies and us as we continue to process my cancer diagnosis! David watched it that night when he got home from work and said he sobbed through the entire movie. Again, I was reminded I should read more reviews and summaries before I just rent a movie to "entertain" us. 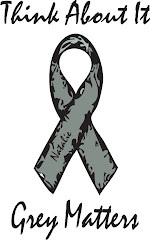 I had an MRI with contrast (that's the shorter less detailed MRI) and it showed no new tumor growth. That is good news since what I have is expected to grow. What my doctor explained is that since an MRI doesn't show cellular level we can't know if the cells are not dividing anymore or are just dividing much slower now. Either way, no new evidence of new tumor growth is good news. Hopefully the chemo will continue to shut down the blood supply to the tumor and stop the growth and then start killing it so that we can see a decrease in tumor size! I also completed round 9 of chemo in May. 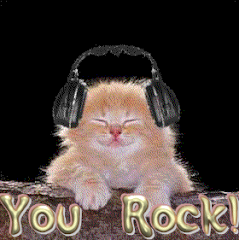 My next doctor appointment is on June 12 and I'm scheduled for round 10 of chemo to start on June 17. My next MRI with profusion (long one with more detail) is scheduled for July 5th. Of course all of these appointments and chemo start dates are contingent on my weekly blood work. The first big event in May was Mother's Day. This year we didn't go to Arkansas like we usually do because David was working Saturday and Monday so I didn't want to make the trip alone with the kids. We did however get to go to lunch and sit on the patio at my favorite place... Joe T Garcia's with David's mom and dad. It was a very nice relaxing day together. Seems like most of our BIG activities all happened during the last two weeks of May that I will from this point forward refer to as "The 2 Week Mommy Marathon"! We had James' last week of pre-school, James' 5th Birthday (the actual one), James' 5th Birthday Party (he asked if he was 6 that day...), Memorial Day Weekend (which in the car business means David works NON STOP), Kirstyn's last week of school including 2nd Grade Awards Ceremony and End of Year Party. Whew! At least David and I managed to work in a date night too! On James' actual Birthday we went as a family to Chuck E Cheese to play games. 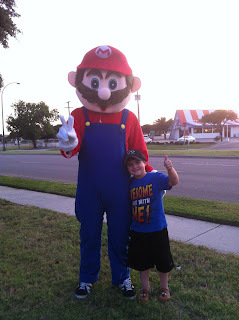 We had a great time but the definite highlight of his Birthday was getting to take his picture with the Mario on the side of the road on the way home! He was standing there waving at the cars because a new video game store was having a grand opening. James started screaming... look its Mario, a big one! I've never met a REAL Mario. So fun that it really is the little things that kids just love! He is still talking about getting to meet Mario the very first day he was there. We are still slowing down to wave at him on a very regular basis. Poor Mario, it's been rather hot here already! For James' birthday party we had a fun swimming party at the YMCA indoor pool. The theme this year was "Where's My Water" after the iTunes game that he loves to play. Since Disney hasn't released any products to go with the game other than the tshirt I was able to buy for him, I decided to take on the challenge and decorate his cake. (I purchased a chocolate cake from Costco so I didn't have to bake too, just decorate!) James loved his Swampy cake and that is all that matters! Also, thanks to Disney, my kids have been seeing advertisements about other kids having parties with themes around giving to others. Kirstyn is so proud that she asked for and was able to donate food to the Backpack ministry at church, but James started asking what he could do for his party that would help others. After much discussion about what he likes, he concluded there were just too many kids that didn't have hats to wear and in his opinion that is tragic... especially kids with no hair. So, we asked that his friends not bring him presents but bring hats for him to donate to kids with cancer so they can wear them if their hair has to fall out. He ended up with 27 hats and $15 to spend on more hats! He is excited to take them to donate them to a Children's Oncology Unit. And I just liked these pictures of James (notice he even has a swimming hat!) with his cousin Bryton and this picture of me with my mom and little sister Neida. Well, there was my May recap! More blog posts to come very very soon! Next up... My ONE year celebration or a more serious one that I have had spooling in my brain for a few days now.